I’ve been experimenting with plant dyes for a while but still feel a bit in the dark when it comes to the effects of pH on plant pigments… Lots of experts allude to the importance of pH in their books and blogs but it seems there is very little detail about it… so I decided to follow an experiment outlined by Jenny Dean in her wonderful dyers bible, Wild Colour (so worth getting your hands on if you’re at all tempted to try dyeing with plants!) which displays the effects of not only pH modifiers but also pre-and-postmordanting. Mordanting is also pretty new to me; I’ve been pre-mordanting yarn with alum and cream of tartar (that is, treating yarn before dyeing) with good results but I feel quite ambivalent about introducing salts and metals, such as copper and iron, and other substances like ammonia into my dyebaths or as post-treatments… I know I can learn more about the potential colours held by a plant if I use them but I’ve been asking myself to what length I’ll go for that knowledge… it is a really personal question and I’m still working out how I feel about the potential environmental cost of my experiments and so I generally avoid using anything other than alum… but I thought it was important to temporarily put aside my ethics for this comprehensive experiment, hoping it would prove enlightening! To prepare the dyebath, I put 250gm dried madder root (1:1 ratio of madder to fibre) in a large jar, covered with boiling water and set the jar in the sun for 2 weeks to soften the woody roots. I then poured off the soaking water (as madder releases its yellow and orange pigments first and the more desirable red pigments only later) and repeated the process, soaking the roots for another week. I then chopped the madder as finely as possible to maximise surface area, placed it in my large, heavy-bottomed dye pot, covered with warm water and then slowly heated it to 65C for one hour. I left the pot to cool overnight and then heated and held it at 65C for another hour the next day. Phew, it was finally ready for the fibre! 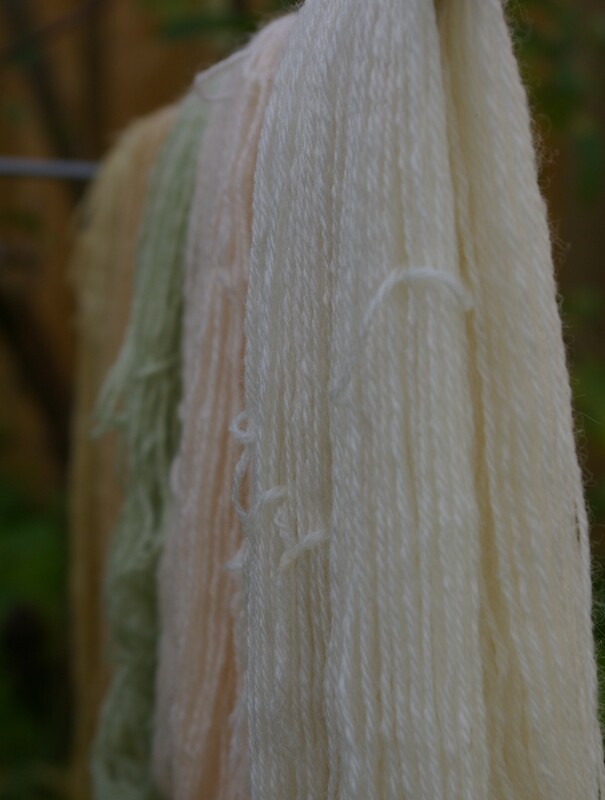 In preparation for dyeing, I wound 25 10gm skeins of 5-ply Polwarth yarn from local producer Wendy Dennis (which I’m discovering takes dye really well, almost as well as superwash which soaks up everything but often has trouble holding colour because of the stripping involved in its production!) 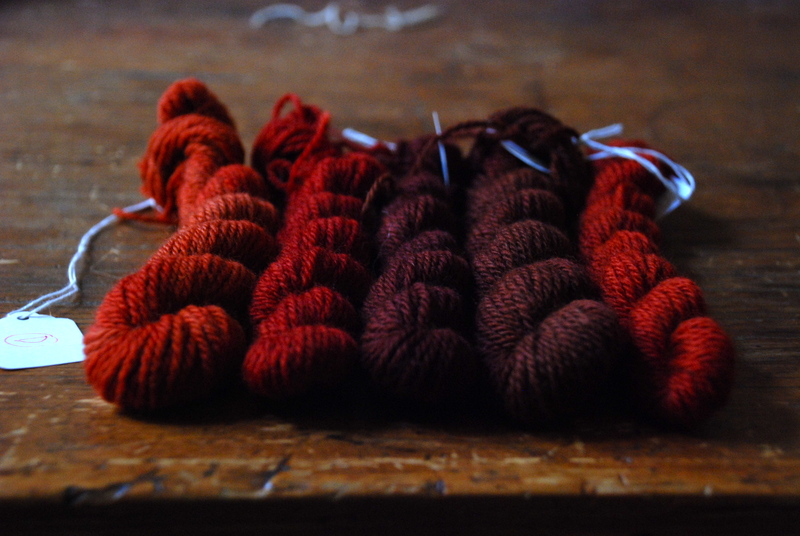 and set aside 5 skeins. The other 20 were treated as follows: 5 premordanted in 10% alum, 5 in 2% copper solution, 5 in 2% iron solution and 5 in rhubarb leaf decoction. All skeins were labelled with a letter from A to Y which indicated their pre-treatment, written on a square of heat-proof plastic (like a milk container) with a permanent marker- this is essential as it becomes impossible to keep track of what is what later! 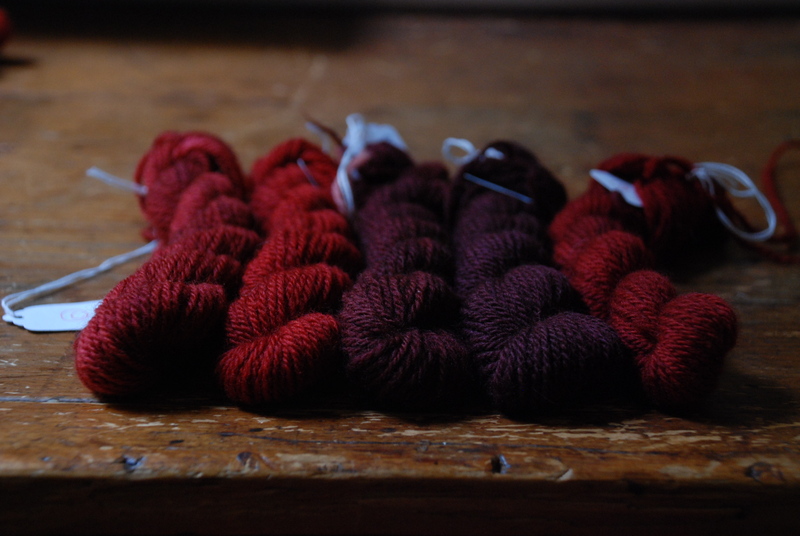 While still damp from their pre-treaments, I then added the 25 skeins to the dye bath and slowly brought the temperature to 65C for 2 hours and then left the bath to cool overnight. Actually, it was meant to be overnight… but life got busy and I didn’t get back to the pot until a week later! No problem though- wool fibres are designed to withstand permanently damp conditions over long winters! I removed one skein from each premordant group and hung the 5 to dry with no further treatment. * I’ve been trying to photograph these for days but the low levels of light combined with the reds make it super hard to capture the colours accurately! The samples are all less orange than they look and there is quite a lot more contrast between the different groups than appears in the group photos. See the top photo for a clearer picture of the contrasts! One from each group was placed in a glass bowl with hot water and 100ml of vinegar and left to sit for 15 minutes- the vinegar brought the pH of the water down from 5 to 3, forming an acidic bath, which tends to bring out the orange tones in reds. One from each group was placed in a glass bowl with warm water and 50gm of washing soda and then 50ml of ammonia and left to sit for 15 minutes- the washing soda took the pH to 7 (still in the neutral zone and wasn’t high enough to change the colours of the yarn) whereas the ammonia brought the pH of the water up from 5 to 9, forming an alkaline bath, which usually makes colours pinker in tones. One from each group was placed in a pot with warm water and 1gm copper dissolved in water and then held below simmering for 15 minutes- copper makes colours greener or browner in tone and often helps to make colours more permanent. One from each group was placed in a pot with warm water and 1gm iron dissolved in water and then held below simmering for 5 minutes- iron makes colours darker and more sombre in tone and often helps to make colours more permanent. – Pre-mordanting with copper and iron leads to much stronger colours than modifiying with them after the dye-bath. 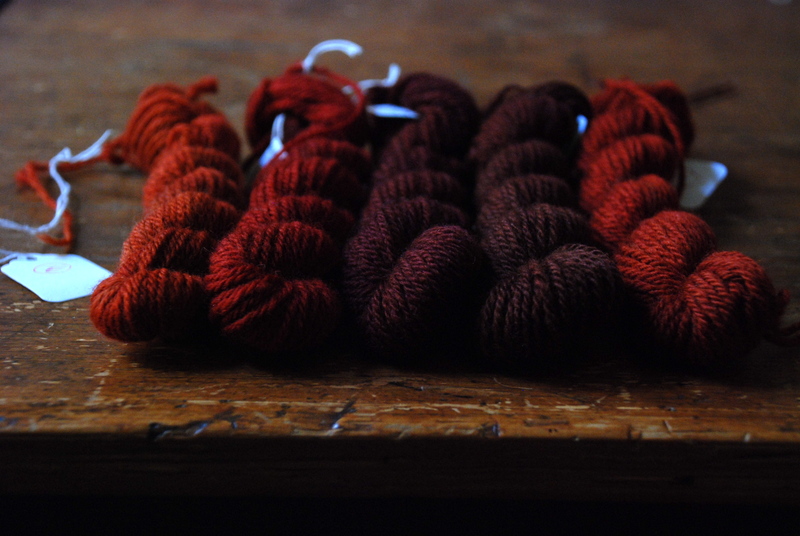 – I was surprised that the alum-mordanted skeins turned out a darker, rusty orange than the non-mordanted skeins- Jenny Dean finds the opposite. – The copper-mordanted and iron-mordanted skeins dyed about as dark as each other, the copper a dark aubergine and the iron a tobacco brown. In the photos outlining this experiment in Deans book, the copper looks much darker. – The rhubarb-mordanted skeins dyed very similarly to the non-mordanted skeins- I used very fresh, new leaves so will try tougher, older leaves next time as they may hold more oxalic acid, the mordanting compound. 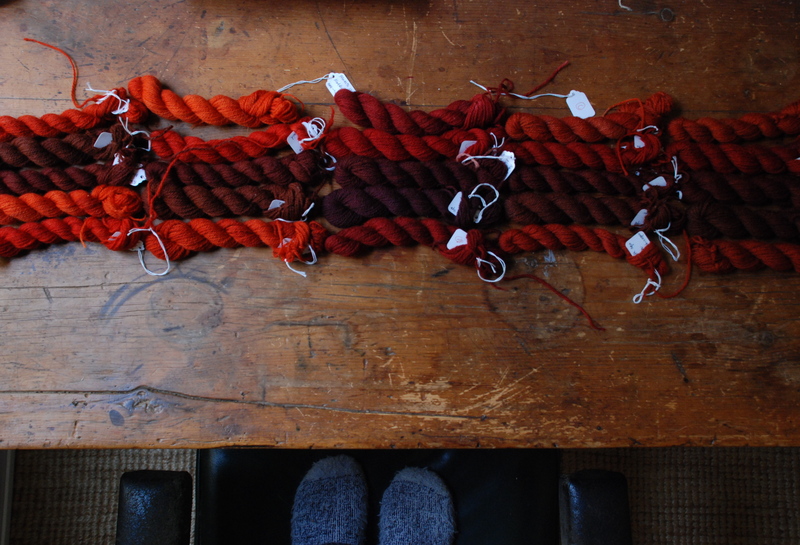 – The acid post-treatment skeins ended up only slightly more orange than those which had no post-treatment- I think this is because my water is naturally acidic. – As stated by many dye experts, the alkaline post-treatment is the way to go for red tones! – I expected all the skeins in the copper and iron post-treatment groups to end up much darker than they did… perhaps I didn’t use enough in the baths. And my thoughts on modifiers and mordants after the experiment? Vinegar I’m fine with using but ammonia is pretty strong so I’m going to try to work out how much washing soda I need to add to take my water to alkaline, as well as capturing rainwater to see how that affects pH. I definitely saw first hand the increased range of colours attained with copper and iron so I’m going to try the methods outlined in Harvesting Colour for using scrap materials to make mordants. I didn’t use them here as I wanted to be exact with quantities but it feels like a much better option than buying powders! It seems like I ended up with a very seventies palette! I feel like I should be weaving a shagpile wall hanging with them ; ) There are some beauties though…and it is wonderful to have more confidence in extracting the tones that appeal to me. 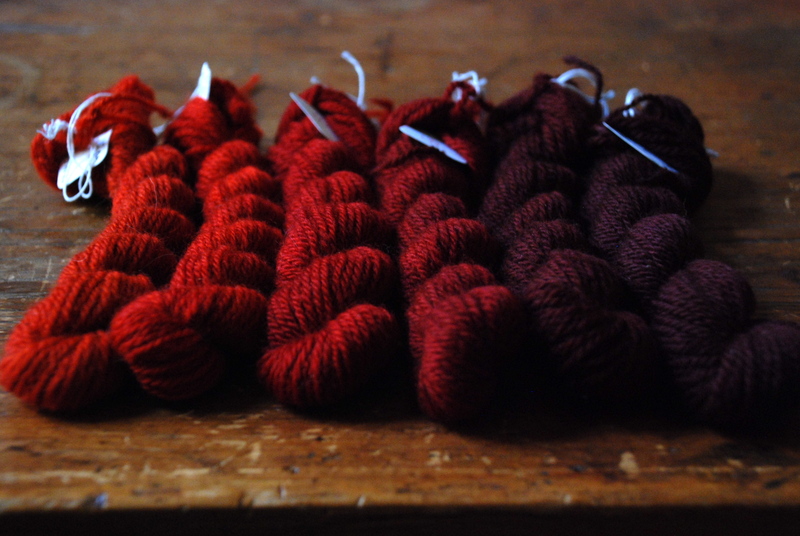 As for all the little 10gm skeins, I’ll be using some of them for colourwork and passing the rest on. I thought I might hold my first giveaway on this little blog! So leave me a comment if you are interested and I’ll draw it next week- after I show my dye teacher the results! 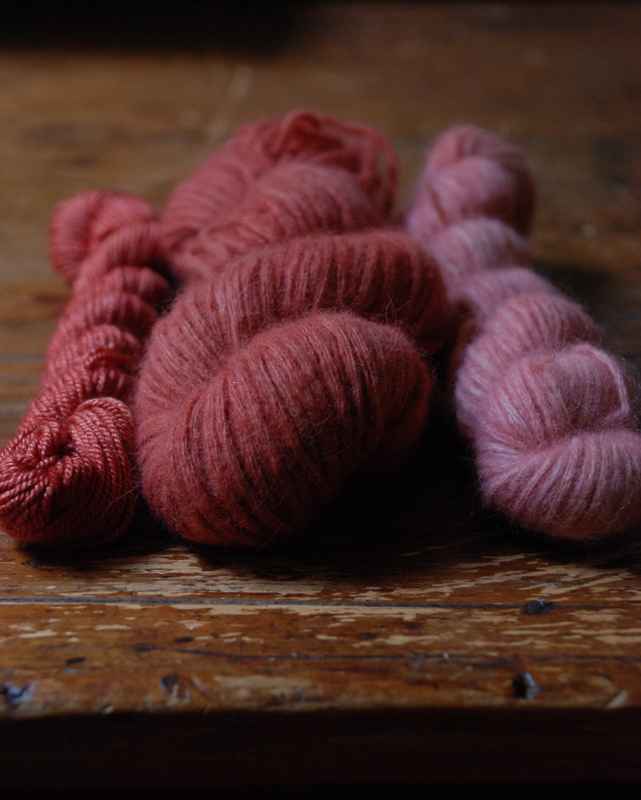 PS These are silk/wool and angora yarns that I put in afterwards to exhaust the bath… I used an alkaline post-treatment for those pink-salmon tones and think I like it better than the others! This entry was posted in dyeing, knitting and yarn, plants and tagged dyeing with madder, jenny dean, knitting, madder, natural dyeing, plant dyeing, yarn on July 11, 2013 by admin. What a fabulous post! I had no idea you can use rhubarb leaves as a mordant. I really need to get out my dye pot more often. You are amazing, so inspirational and I can’t wait to see what you make with this beautiful yarn. Jules – what an interesting experiment. 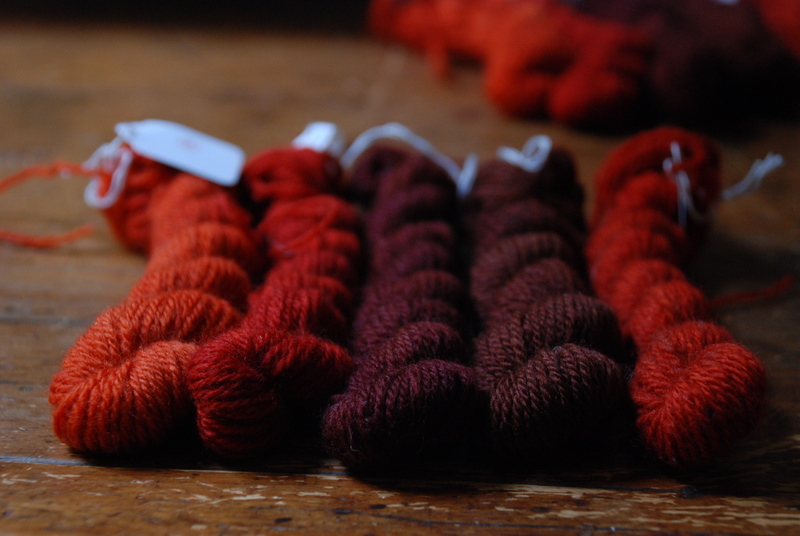 I am particularly drawn to the yarn that was mordanted with copper in each of the sets! Stunning colours! Your experiments with plant dyeing are fascinating, I wonder how the yarns will go regarding light fastness, will you let us know please? You’ve managed some gorgeously deep shades there! I don’t think iron salts are any more harmful than aluminium salts. Copper salts are probably okay as long as they’re not going near the sea. (I use scrap copper + ammonia to make the salt.) Evaporating and binning the exhaust scrapings is probably the best. I’m in two minds about tin, and I won’t use chrome. Some plants are natural metal accumulators – for instance members of the Melastonum and Symplocos genera hyperaccumulate aluminium and have been used as mordants. I know there are many other metal accumulators out there but haven’t taken notes. Hi, I just found you via the Craft Sessions site (which is beautiful and inspiring). I’m an experimental dyer of fabrics and natural plants, so always eager to find info and beautifully stunning images from other dyers. These colours are fabulous. There’s so much to keep learning about it all. Thanks, I’ll be back for more looking and enjoying. I hope your classes at the Craft Sessions are lots of fun; I’m too far away to be able to book in unfortunately. How informative experiment, thank you. With rhubarb leaf mordant I get almost the same color as with not mordant, like you did. With no mordant, I get more orange color than you did, and perhaps also lighter color. This might be a water thing. With iron (2%) after bath I get purplish tones, but I keep the yarns in the simmering bath for 15 minutes. Thank you so much for the post! 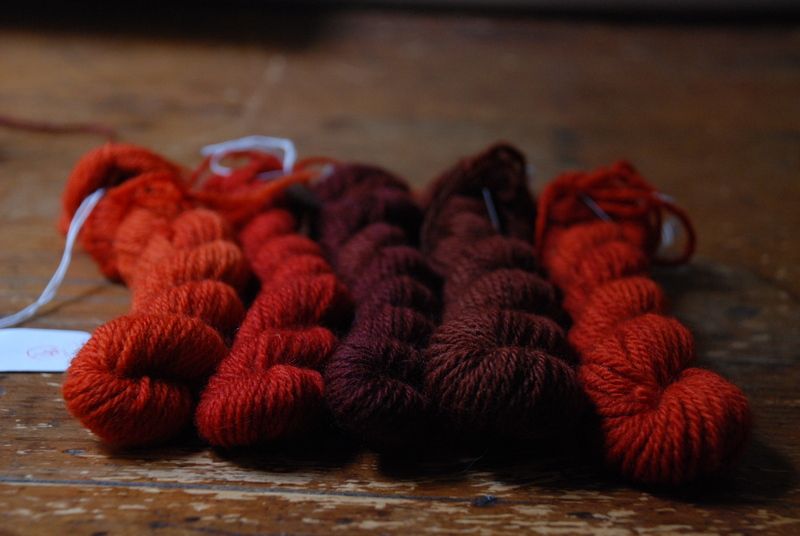 I have just started natural dyeing fabric and would very much like a deeper colour than the orange sunrise I have got from madder on silk. Post aklanine bath it is! Hello, I just posted to your old blog before checking whether you were still active. I paint miniatures and am in a discussion about how bright a red colour could be achieved around the 1400s. My understanding that madder can be used to make an intense red. I would like to use your images and a reference to this post in my post. I will likely be making a new post with this information instead of updating the current post since I’m already planning a follow up.